WhatsApp messages are missing randomly from iPhone, how to recover? How to recover randomly missing whatsapp messages from iPhone? How to retrieve iPhone randomly lost whatsapp messages? Read here to find missing whatsapp messages. It is so weird that whatsapp messages are missing randomly from iPhone. Sometimes, you may lose those whatsapp messages not backed up, so you may lose them forever probably. The question here is, how to recover randomly lost whatsapp messages from iPhone? Is it likely to retrieve iPhone randomly missing whatsapp messages? Undoubtedly yes. We have methods to help you find lost whatsapp messages from iPhone. Just calm down firstly and keep reading here. When it comes to iPhone whatsapp messages recovery issue, I think it is pretty hard to find lost whatsapp messages if without the help from iFonebox, which is a powerful WhatsApp data recovery software. As the best iPhone data recovery tool, iFonebox is a great helper to recover randomly lost or deleted text messages, contacts, wechat messages, whatsapp messages, notes, etc, from iPhone or iPad directly. Also, it is supportive to extract and restore lost data from iTunes or iCloud backup selectively, without wiping any data on your iOS device. According to the description of the user, obviously, he had no backup for those randomly missing whatsapp messages. Thus, he can only recover missing whatsapp messages from iPhone via iFonebox. It is necessary to download and install iFonebox on your computer firstly. Two versions are optional: Windows version and Mac version. How to retrieve missing WhatsApp messages from iPhone? Launch iFonebox. Choose Recover from iOS Device mode. Don't forget to plug in your iPhone to the computer with USB cable. Once connected successfully, your iDevice will be detected by iFonebox. If it is the first time to connect your iPhone to the computer, you need to click Yes so as to trust the computer on your iPhone screen. Just click Start button to begin the analysis process. Preview and select missing whatsapp messages to recover. Now you have the chance to view and choose randomly missing whatsapp messages you need, then click Recover to PC button to transfer them to your computer. 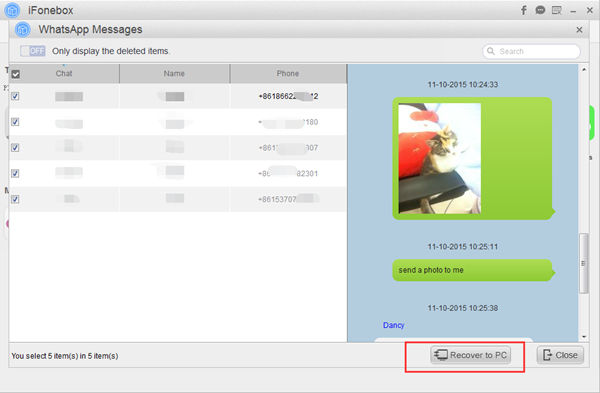 In short, it is fairly convenient to recover randomly whatsapp messages from iPhone under the help from iFonebox.